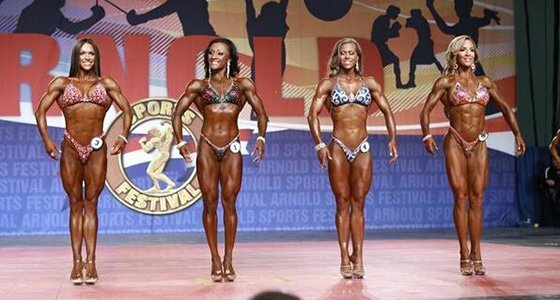 As the Arnold turns 25, the women’s competitions offer up some of the tightest competition in years. Expect to see some familiar names and a couple of new ones at the top this weekend! This year doesn't only mark the 25th anniversary of the Arnold Classic. It's also the silver anniversary of the equally contentious women's Ms. International competition, and the 10th of the Figure International. These two competitions and the women's Fitness International have traditionally been dominated by a few big names, but there's no doubt that we'll see new champs in at least two of those categories. Most, but not all, of the elite competitors brought their best stuff to the Friday morning pre-judging. Let's take a look at how the callouts played out. The reigning Ms. Figure International Nicole Wilkins has held the title for three years, but she chose not to aim for a fourth. That leaves this year's 18 competitors to battle it out to be her successor. Until proven otherwise, last year's runner-up Erin Stern is the odds-on favorite to win it all. Candice Keene and Ava Cowan were also considered to be in the running as they tried to improve upon subpar performances at last year's Olympia. Cowan is a crowd favorite who has been working really hard on balancing out her symmetry and conditioning. I thought she nailed it, but for some reason she was not in the first callout, which was disappointing. Keene definitely stepped up her game, and it may have paid off big time! I give her a slight edge over Erin Stern this morning. She was leaner than Stern, and her symmetry is incredible. Candice Lewis, who won an impressive five shows last year, is definitely looking to make a mark. Heather Dees is another one to look out for, as she has quickly ascended the ranks to make the first callout. Mallory Haldeman was in the first callout this morning as well. She is definitely moving up as well, having finished 5th in last year's Olympia. She's in my top five tonight. Camala Rodriguez, who was last year's Fitness runner-up, has successfully made the transfer to Figure by making the second callout. This year's Ms Fitness International will also crown a new winner. The 5-time champion Adela Garcia will not be competing. I expected nothing but amazing physiques and exciting routines as the competitors vied for Garcia's crown, and they didn't disappoint. Oksana Grishina actually beat Adela Garcia in the 2012 Arnold Fitness Europe and took 3rd in last year's Arnold Classic Fitness International. She's definitely a strong contender, particularly because Camala Rodriguez, who was last year's runner-up, has made the switch to Figure. Bethany Cisternino and Tanji Johnson took 4th and 5th and respectively at last year's competition. They're also looking to take advantage of Garcia and Rodriguez's absence and are well-positioned to move up. Rural Graber-Vasani, who placed 3rd at last years Master's Olympia/Miami Pro and 5th at the Ft. Lauderdale Cup, was also in the first callout today. With her well-balanced physique, it looks like she scored in the top 5 in the physique round. We'll see how her routine goes tonight. That is huge percentage of the overall score. Trish Warren is returning to the stage after taking time off to become a mom. Her last competition was here at the Arnold Classic in 2011, where she took 3rd place. A lot of fans are wondering if they would see a new and improved Trish Warren. She seemed little nervous on stage, and I can't wait to see what she does with her routine tonight. Kizzy Vaines, who placed 7th in Columbus last year, is looking to improve her placing this year. 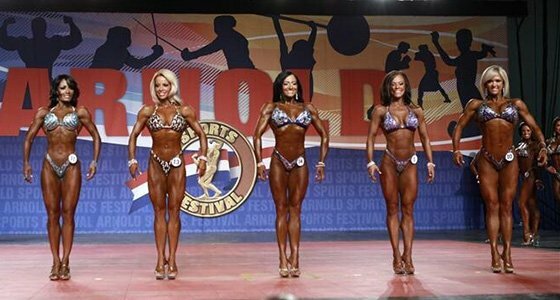 Her physique could have been leaner, which no doubt kept her out of the first callouts. This year marks the 25th anniversary of Ms. International, and the 6-time champion Iris Kyle is looking to expand her already impressive legacy. She returned to the stage today looking like the Iris Kyle we have all come to expect. Her impressively well-rounded physique, full muscle bellies, and striated glutes all made a comeback to the Arnold Classic stage. She truly has set the bar extremely high for the rest of the competitors. Kyle's main rivals on stage are definitely last year's winner Yaxeni Oriquen and runner-up Debi Laszewski. They are not going down quietly. Both brought the heat to the stage this morning. Debi's conditioning was as good or better today than it was last year. Yaxeni, though, didn't look as sharp as she did last year. Her glutes were not as tight from the back, and she seemed to be a little soft as well. Her muscle bellies were just not popping. I would give a slight advantage to Debi, who I believe may be second to Iris. Cathy Lefrancois was in the second callout but was kept in the center. She is definitely aiming for a top-5 finish tonight.